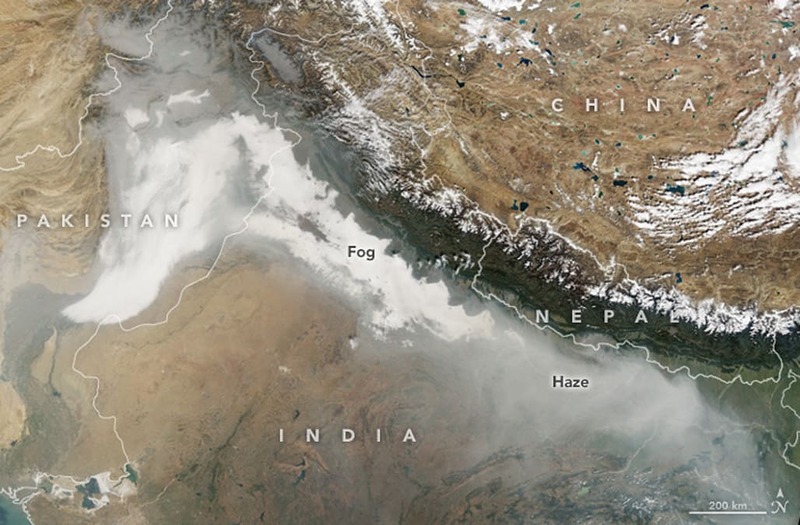 New Delhi, India has spent days under a haze so thick officials have canceled school and delayed flights. Arvind Kejriwal, the chief minister of Delhi, even likened the city to a “gas chamber,” reports the New York Times. NASA on Thursday shared images of what the cover looks like from space. An image captured by its Aqua satellite on November 7 shows the region in natural color and, as many areas of the ground below are fully concealed, gives a sense of the haze’s density. Particulate assessments from the same satellite further demonstrate how thick the air in Delhi has been. A Terra satellite photo from the following day makes it evident the mass is not moving along quickly. According to NASA, Wednesday readings taken at the U.S. embassy in the city put the air quality index at 1,010. The upper threshold of acceptability is 100. Smoke from nearby crop fires is a significant contributor to the annually recurring problem. “With the arrival of cooler weather in November, the smoke mixed with fog, dust, and industrial pollution to form a particularly thick haze. A lack of wind, which usually helps disperse air pollution, worsened the problem,” NASA notes.